Have you got something you would like to say? Order a custom Scrappy Sign with any wording in english. Express Yourself! Custom Scrappy Signs are priced by size and amount of words. Prices start at 20.00 which includes shipping within the USA. Special Quotes are also available for special signs, or quanties. Wholesale inquiries are welcome minimum order required. Campsite Signs, RV signs are one of our specialties too. 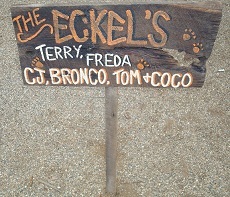 The photo below shows an example of a custom scrappy sign. I made this sign for my husbands garage, in his favorite sports colors. He is a Bengals football fan. A Sign like this would cost $40.00. It is approx 30 inches long and 6 inches tall. Please Contact us for custom Scrappy Signs. Give as many details about the custom sign you want as possible when you inquire. Include wording, approx size sign desired and paint colors. 2 - 3 colors are used on all signs. Your inquiry about custom signs will be answered promptly. The Sign you see in this photo is another custom Scrappy Sign. This has our names and the names of our pets on it too. This is intended to be a campsite sign. Signs like this are $50.00 This sign is mounted on a post. Wire hung the price is $45.00 Shipping included. This is intended to be a campsite sign. Campers get creative with their camp decor. So, I have started offering Campsite signs. You can get any wording, names etc on this type of sign. This one is post mounted. Wire hanger is also available. You can hang the sign on a shephards hook. The outhouse sign above is another example of a custom sign. As you can se in the photo above the customers names are added to the sign. A sign in is size is 30.00 Including Shipping It is approx 22 inches long. 8 inches tall. The Papa's Barn Sign below is another example of a custom sign. A sign in this size is 40.00 including shipping. This sign was approx 24 inches long and 9 inches tall.